You'll love how easy these Chocolate Butterscotch Pinwheels are to make. Pinwheel cookies are a little unusual in that they usually combine two complementary flavors that are rolled together and create a fun and visually-appealing, spiral-shaped cookie. 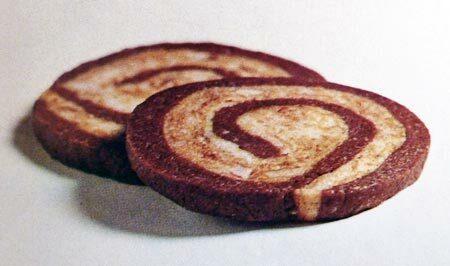 Much like the toy pinwheels we used to play with as kids - which is probably how the name for these cookies originated. This particular recipe is also unique in that the chocolate dough is baked first, then the butterscotch filling is added and then rolled and refrigerated. Once they are set, simply slice and enjoy! In a large sauce pan, melt chocolate chips and 2 tablespoons butter over low heat, stirring constantly to prevent burning. Once melted, remove pan from heat. Add sweetened condensed milk, flour and vanilla and blend well. Spread mixture in 15x10-inch jelly roll pan which has been greased, lined with waxed paper and greased again. Meanwhile Prepare the Butterscotch Filling: In a small saucepan, melt butterscotch chips and 2 tablespoons butter over low heat, stirring constantly. Once chocolate dough is done baking, immediately turn chocolate base onto clean waxed paper that has been lightly sprinkled with confectioners' sugar. Spread butterscotch filling over baked chocolate dough. Roll up dough, starting with 15-inch side. Wrap log with plastic wrap or waxed paper and store in refrigerator until set. Cut into 1/4-inch slices before serving. This recipe yields about 60 Butterscotch Pinwheels.